Developed by Adobe and Zend Technologies, Flash Builder 4.5 improves Flash Builder 4 to help PHP developers get the most out of their apps. Flex is an open-source framework developed and distributed by Adobe Systems. It is based on the Adobe® Flash Platform and primarily provides a streamlined approach to the development of Rich Internet Applications. Flex is multi-platform—this means that, with some exceptions, you can run a Flex application on any platform that supports Adobe Flash Player. If your users run on Windows, OS X or Linux and their browsers have a recent version of the Flash Player plug-in installed, they will also be able to run your Flex applications without a problem. Because Flex is open source, there is no cost associated with creating and distribution applications that are based on it. The Adobe Integrated Runtime (Adobe AIR) is a companion technology to the Flex framework that extends the functionality provided by the latter into desktop application development. With AIR, you can build Flex applications that can be deployed as native applications on your user's machines, thus gaining all the advantages of running in a desktop environment. Like Flex, AIR is also cross-platform, which means that you can write your code once and immediately deploy it across multiple operating systems. Because they run natively rather than in a web browser, AIR applications also gain access to functionality that is usually restricted by the Flash Player's security model, such as local file manipulation, unrestricted access to the network, and so forth. Flash Builder 4 is Adobe's IDE for developing Flex and AIR applications. Although Flash Builder 4 is not required in order to compile or run a Flex-based application, it significantly simplifies the process of Flex development by providing an integrated environment that includes code intelligence, real-time analysis, compilation support, live debugging and much more. Flash Builder 4 is based on the open-source Eclipse IDE and can either be downloaded as a standalone product or as a plug-in for the latter. Like Eclipse, Flash Builder 4 is also crossplatform and runs on both Windows and OS X. Even though Flex is based on Flash, you don’t need to be proficient in the latter in order to use the former. Flex applications are based on the concept of component. A component defines a container of behaviors and, optionally, of a user interface representation. Components can be visual or non-visual, depending on whether the provide an interface of some kind (like a button) or just functionality of some kind (like a library for connecting to a remote server). The visual structure of a component can be easily defined using MXML, Adobe’s specialized brand of XML. Other than the use of specific namespaces, MXML is nothing more than well-formed XML code; by nesting multiple components, you can create complex GUIs without ever writing a line of code. Flash® Builder 4 makes creating new applications as easy as following the steps of its New Application Wizard. Simple select New Flex® Project from the File menu, then choose a name and type for your application. If you intend to write code that will be executed inside a browser, choose "Web" for your application type; if, on the other hand, you want to build a desktop application, choose "Desktop" instead. Flex’s powerful layout capabilities, like the rest of the framework, are also designed to be developer-friendly and are almost entirely based on standard CSS, with a few exceptions designed to make automated positioning easier. AdvancedDataGrid and DataGrid: display tabular data in a rich, editable environment. DateChooser and DateField: simplify the process of choosing and formatting date values. NumericStepper: allows the user to increment and decrement a numeric value. RichEditableText: allows you to create a rich text editor with support for several formatting options (e.g. : italic, bold, etc.). VideoDisplay/VideoPlayer: provide fully-featured and completely skinnable video players that can be embedded directly in your application. HSlider/VSliders:allows the user to select a value by sliding a selector across a horizontal or vertical range. HGroup/VGroup: automatically arrange their content horizontally or vertically. Combine to easily create complex layouts. Accordion/TabNavigator: allow multiple content panels to stack and be displayed one at a time. MenuBar/TabBar: add a menu or tab bar to your component. Flex Charting: adds powerful charting abilities to your applications. While Flex Charting and AdvancedDataGrid were only available in the Professional version of Flex Builder 3, they are now included in all versions of Flash Builder 4. One of the most interesting features of Flex is that it is designed to provide powerful data connectivity capabilities in a variety of formats and protocols, including XML, SOAP, JSON and Adobe’s own AMF. 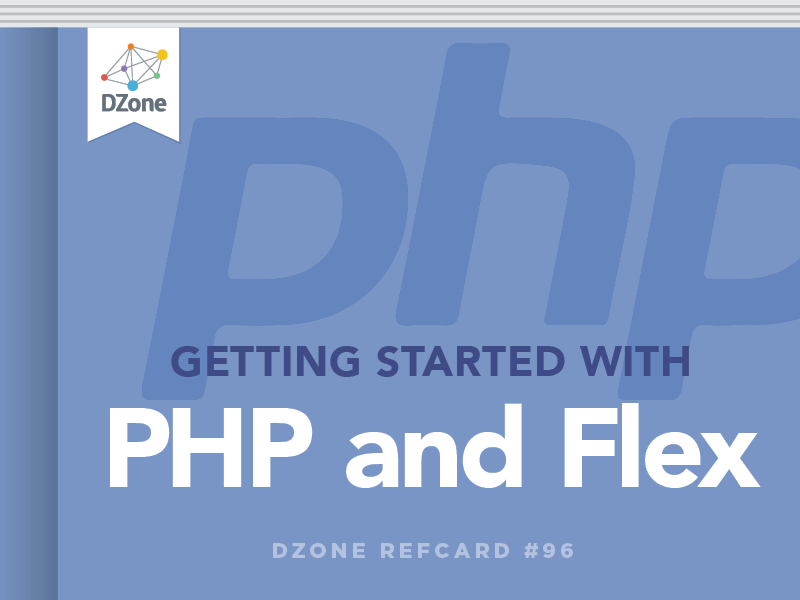 In fact, in most cases you will be able to use Flash Builder 4 to connect your Flex application to a PHP backend without having to write a single line of code in either! At this point, you can click "Validate Configuration" to make Flash Builder 4 run a simple test to determine whether it can access your site as expected, then OK to complete the set up process. Now, Flash Builder 4 will ask you to choose a PHP class that will provide the entry point to which your Flex application will connect. If your code is not encapsulated in classes, you could create some simple stubs for the purpose of providing services to your Flash Builder 4 code. The wizard will automatically fill in the defaults for you based on the name of the PHP file that you select. In order for this system to work, it is important that the class you want to import be stored in a file of the same name [e.g. : Index inside index.php]. Otherwise, Zend_AMF will be unable to find it. At this point, if you website does not include a copy of Zend_AMF, a Zend Framework module that Flash Builder 4 uses to marshal data, remote procedure calls and error management, you will be asked to download and install a copy. This is required because Flash Builder 4 makes use of Action Message Format (AMF), a protocol that PHP does not support by default. Your application does not need to use Zend Framework in order to take advantage of AMF—Flash Builder 4 will only use Zend_AMF in order to communicate with your server, independently of the rest of your code. Once you click Finish, the wizard will create a series of classes inside your project that provide all the necessary functionality required to connect to your project and execute your web service. Remember that it is your responsibility to provide a security layer where required—for example, by passing a secure key to the service as appropriate. Your application is now capable of connecting to the PHP backend, but the data that the latter provides is not yet wired to any of the controls. All you need to do in order to connect the data returned by a service call to any of your components is to simply drag it from the Data/Services panel to the component. Flash Builder 4 will ask you whether you intend to create a new call, or use an existing one. In the former case, you will first need to specify the type of data returned by the remote service call, because the data connection wizard has no way of determining it by means of static analysis of your code. Flash Builder 4 can, however, auto-detect the data type returned by a service call by making a call to it, or you can specify it by hand. Where a sample service call will have no adverse effects on your PHP backend, allowing the wizard to determine the return type automatically is usually sufficient and produces all the infrastructure required to handle the data on the Flex side. Your application is now fully functional—if you execute it, you will see that the data service is automatically called as soon as the DataGrid object finishes loading. If the call is successful, the data is immediately loaded and displayed. If you prefer to add a manual method of refreshing the information, you can simply drag the appropriate data call on to the button—this will create all the code needed so that, when the user clicks on it at runtime, the service will be called again and all the data automatically updated. While much of the data types are interchangeable between AS3 and PHP, there are some notable differences. Integer values in PHP can either be 32- or 64-bit long, whereas, in AS3, they are always 64 bits. Therefore, you must be prepared for the fact that a numeric value passed from AS3 to PHP may be represented as a float even if it is, in fact, just a large integer. String values in AS3 are always Unicode-compliant. It is up to you to ensure Unicode compliance on the PHP side. Array values in AS3 can only have contiguous numeric keys starting at zero. If your PHP arrays have string keys or non-contiguous numeric keys, they will be represented as objects in AS3.You should avoid passing objects into AS3 that contain members whose keys are reserved keywords, as handling them will be inconvenient—and many of Flash Builder 4's facilities will refuse to work with them. Under most circumstances, these issues are unlikely to affect your application because both AS3 and PHP have a significant amount of flexibility. AMF is not your only choice when it comes to external connectivity from Flash Builder 4—almost exactly the same functionality can just as easily be used to connect to an XML web service powered by SOAP. Like before, Flash Builder 4 will fetch the WSDL file from the server and introspect it, extracting all the available remote procedure calls. You will then be able to drag and drop the data into your application like before. Of course, SOAP is not the only way of retrieving XML data from a remote location. Flash Builder 4 provides facilities for introspecting a remote URL that simply returns a flat XML document and extracting information from it. The resulting data provider will become available in the Data/ Services panel of Flash Builder 4's GUI, from where you can connect it to your components like before. Be mindful of the fact that, when manipulation raw XML, Flash Builder 4 has no way of determining whether your service provides data in a consistent format. Therefore, you should ensure that this is the case, or your service call may unexpectedly fail at runtime. While PHP has had built-in support for JSON since version 5.2.0, AS3 does not have any facilities for manipulating JSON data. Luckily, Flex provides a number of different ways for using JSON. Once you provide the correct information and click on Finish, the wizard will once again create all the infrastructure required to run your service and make it available as before. The HTTP Data/Service Connection wizard also supports XML data. In most cases, you will want to develop your application in Debug mode. This causes the Flex compiler to add all sorts of useful information that can be used to debugger to help you address any issues that may occur within your application. However, when it comes time to deploy your application for production, you will want to switch to a Release build so that you can end up with the most compact and efficient codebase possible. You can do so by selecting Export Release Build... from the Build menu. Most of these files play a support role to your application—in fact, the only one you will normally interact with is the host HTML file that contains the code required to display your application. You can change the template used to generate your host HTML file by editing the html-template/index.template. html file in your application's root directory. It is sometimes useful to pass data, like request parameters, to your Flex application as it is being initialized on the client browser. All you need to do is change the content of flashVars to suit your need—that same data will be made available inside the application as the FlexGlobals.topLevelApplication.parameters object, where you can peruse it as needed. When running in the browser, Flash employs a very strict security model that places your code in a sandbox through which all network and disk activities are regulated. The sandbox is turned off during debugging—therefore, you don't normally become aware of it until you run your code in production mode and find out that your application cannot access any of its remote data. Flash supports a number of different sandboxes, depending on what kind of data your application needs to deal with. Most of the time, you will want to use the local-with-networking sandbox, which allows your application to access remote locations, but denies all access to local files. By default, the sandbox model prevents an application from accessing any resources outside of its own domain, unless that domain specifically grants access with a crossdomain.xml file. Therefore, it is important to remember that you may not be able to access information across different domains. Adobe AIR applications usually run in the local-trusted sandbox and, therefore, are not subject to connectivity restrictions. While much of the functionality provided by Flex can be accessed without writing significant amounts of AS3 code, it is entirely possible to address extremely complex tasks entirely within the Flex runtime — systems as complex as encryption engines and image compression libraries have been built in pure AS3 and are used in production every day (in fact, the entire Flex framework itself is built in AS3 as well). Flash® Builder 4 makes creating new applications as easy as following the steps of its New Application Wizard. Simple select New Flex® Project from the File menu, then choose a name and type for your application. If you intend to write code that will be executed inside a browser, choose \"Web\" for your application type; if, on the other hand, you want to build a desktop application, choose \"Desktop\" instead. At this point, you can click \"Validate Configuration\" to make Flash Builder 4 run a simple test to determine whether it can access your site as expected, then OK to complete the set up process.